Meet Andrew of Super Voices! You are here: Home / The Spin / Meet Andrew of Super Voices! Get ready for Super Voices, our newest community theatre project! Two performances (only!) on Fri. June 12 at 7 pm & Saturday June 13 at 4 pm (2015) at the Roundhouse . Tickets are Pay What You Can. RESERVE NOW. Reservations are highly recommended. Wheel Voices nurtures emerging talent in the disability community. We explore and develop stories through theatre, music, and dance, and there are a lot of SUPER TALENTED PEOPLE who participate. Today, we proudly profile ANDREW VALLANCE! 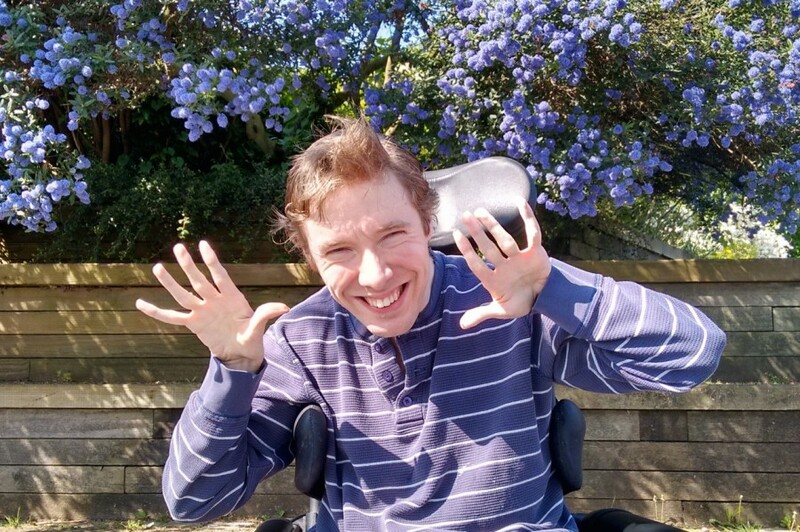 Andrew Vallance is a Wheel Voices veteran, having participated since the first project in 2011, which culminated in a performance at GF Strong. It might have been in that gym where he realized (for the first time) just how much he could charm an audience. Born and raised in Fernie, BC, Andrew is a movie buff, a stand up comedian, and a self-described flirt! 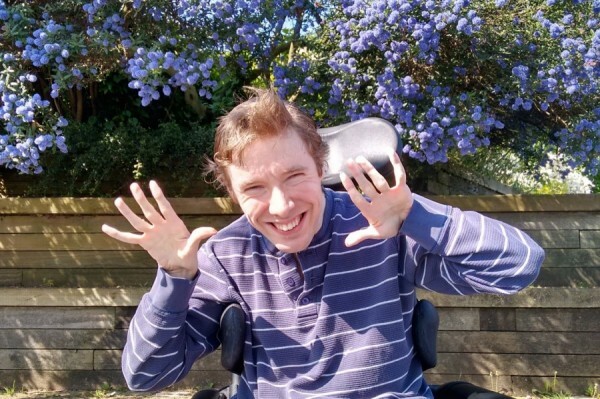 Find out more about Andrew and his experiences with Realwheels and Super Voices! How did you find out about Realwheels? I found out about Realwheels when the recreation director of the group home that I live at told me that this great actor she knew named James Sanders was forming a series of theatre workshops and I said, sure I’ll go. And that’s basically it. 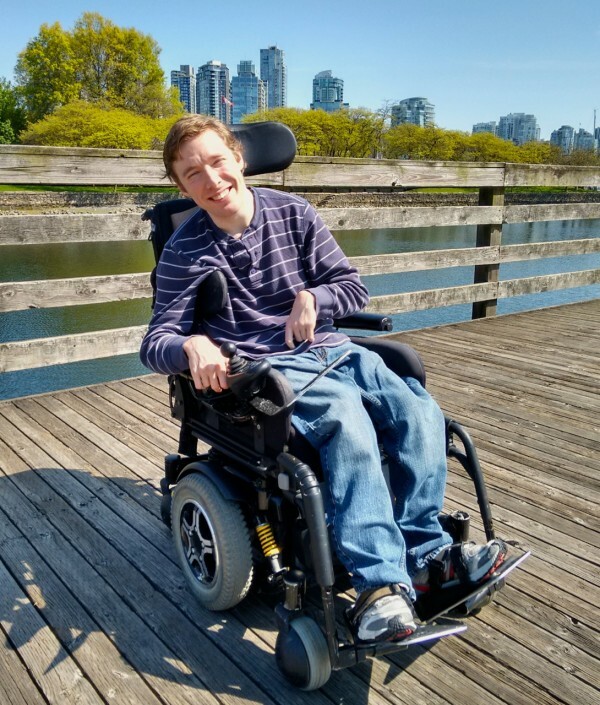 How is Realwheels filling the gap in experiences for and representation of people with disabilities? 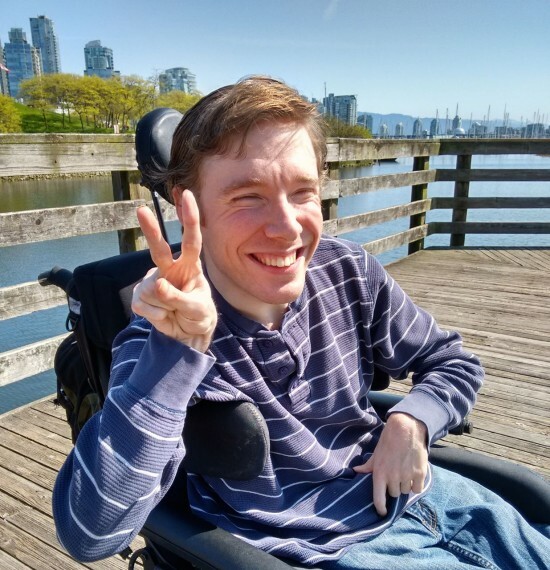 Realwheels is essentially giving voice to the voiceless. People with disabilities are not represented in the mainstream media at all, our stories are not being told. 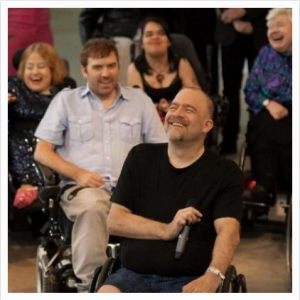 Realwheels is providing a conduit through which we can share our experiences and create. So we can share our non-fiction experiences and we can create fiction. Do you see your experiences being reflected in the cultural life in our city? No, not really. The problem with a lot of portrayals of disability in mainstream media is that you don’t see the rough bits. We’re portrayed as saints. We’re either portrayed as tough-minded people valiantly struggling against the barriers placed in our path or weaklings, like the character John Hawkes played in the Sessions. So we’re either Rick Hansen or John Hawkes. And neither of those portrayals are particularly accurate. They’re both inadequate. Most of us are a mixture of the two. What is the barrier to getting more authentic representation of disability out there? Education, poverty. Inaccessible studios. There really is a lot of work out there for people with disabilities, but I think it depends on the kind of disability you have. If you’re talking about autistic individuals or people with other developmental disabilities, or people with CP, there’s basically nothing out there. We have to make our own art. We have to. Or else we will die as artists and no one will notice us. What draws you to the Wheel Voices program? What keeps you coming back? What draws me to the WVs program is the opportunity to meet exciting and creative people. Wheel Voices essentially opened my eyes to the possibility that I could act, that I could be in theatre. I am a stand up comic and I think that my experiences with Realwheels primed me for that, for the experiences I’ve had in standup comedy. Did you know that you wanted to be a standup comic, or that a career in the performing arts was an option for you before participating in Wheel Voices? No, I didn’t. I considered writing, I considered journalism, some form of creative writing like short stories, but never acting. My sister was always the theatrical one. She was always the one destined to be a star, I would have never thought that it would be possible for me to take this creative path. How has participating informed other aspects of your life? I believe I’ve become more confident. I have more friends and acquaintances since I’ve joined than when I first started and that’s a good thing. What have you learned about storytelling? What makes a good storyteller? Someone who doesn’t get bogged down by the facts. Someone who stays true to the essence of the story but is willing to embellish to make it entertaining. And that is important if you’re telling stories theatrically, like David Roche has done, who is another amazing artist that I have much respect for. Was there one thing that has stuck with you or stands out throughout your experience with Wheel Voices? The epiphany with Realwheels probably happened after the first show in the GF Strong gym and I realized I wanted to do this again. And again. And again. What was it about it that made you feel that way? The ability to entertain audiences. People’s laughter, their appreciation, it’s kind of like a drug. How is Super Voices different from other Wheel Voices experiences? In Super Voices we focus on our superpowers, that is, the characteristics that make us special and different from everybody else. Comedy, my ability to make people laugh. What would you say to others who might be interested in participating? Give it a shot! It’s a good way to make new friends and will open up new possibilities for you. Hope you enjoyed getting to know Andrew Vallance. Now, don’t forget to join us at Super Voices – Two Performances Only! I would like to connect with Andrew if he would be interested in getting some coaching regarding Comedy . I worked at Punchlines Comedy Club in Gastown for 10 years . I also may have some volunteer M/C work for him .